In a significant breakthrough, scientists at the Tata Institute of Fundamental Research (TIFR), Mumbai, have devised a high-power radiation source in the terahertz (THz) region of the electromagnetic spectrum. This study, done in collaboration with laboratories in Greece and France, will be published in the journal Nature Communications on Oct 30, 2017. The search for new and brighter radiation sources is an enduring quest in science and technology. While there are many sources across the entire electromagnetic spectrum, the terahertz region (wedged between the infrared/optical and the microwave regions) is a challenge, and it is only in the last 20 years that sources have become available. High-power terahertz radiation has typically been produced only in large, complex machines like free electron lasers. Compact sources relying on semiconductor antennas and special crystals excited by visible/infrared femtosecond laser pulses have very limited energy outputs, typically in the nanojoule (billionth of a joule) level or lower. They are not useful for many applications. 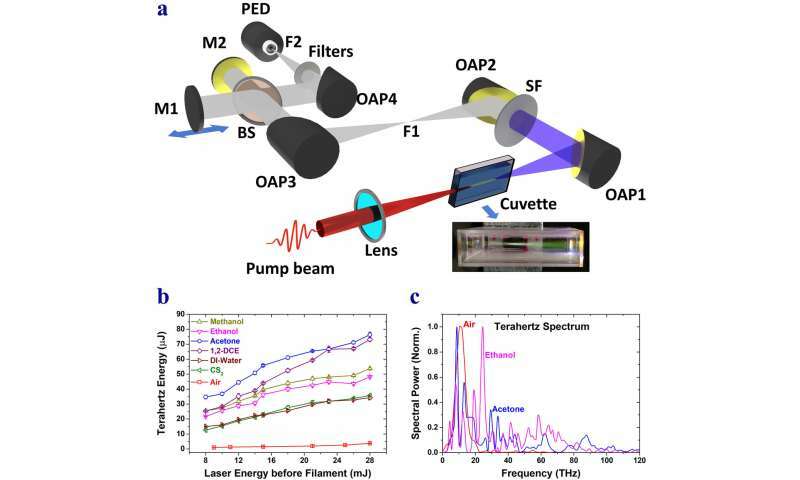 However, high-power femtosecond lasers can excite terahertz emissions a thousand times stronger from a plasma formed in air under special conditions. For a long time, researchers have believed that liquids could not give out significant terahertz radiation because they would efficiently reabsorb whatever was generated. Yet, this is where the TIFR researchers proved successful. In their experiments, they irradiated common laboratory liquids like methanol, acetone, dicholorethane, carbon disulphide and even water, with moderate energy femtosecond laser pulses, ionizing the liquid and forming long plasma channels called filaments. They measured energies as high as 50 microjoules, thousands of times larger than the energies emitted by most existing sources and 10 to 20 times larger than those produced from air. Their careful characterization and systematic study showed that the experimental conditions were simpler than those needed for air. The essence of this model is that the femtosecond laser pulse induces secondary emissions in the liquid which would then combine with the incident laser pulse to produce the observed terahertz radiation. The TIFR researchers are bullish about the applications of their liquid source, the brightest among compact, tabletop sources. They foresee many applications in terahertz imaging, material analysis, explosives detection and terahertz nonlinear optics. This new source certainly increases the stock of terahertz radiation.